I’ve been re-reading many of the works of George MacDonald recently, in preparation for my keynote lecture at the George MacDonald’s Scotland conference at the University of Aberdeen next week (https://gmdscotland.wordpress.com/). 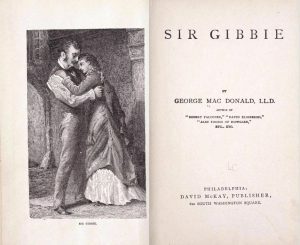 My lecture is titled “George MacDonald and Celticity”, and – among other works – I’ve just finished re-reading Sir Gibbie, one of MacDonald’s “realistic” novels with a Scottish setting (and extensive use of Scotch in the dialogue). ‘So do I,’ said Gandalf, ‘and so do all who live to see such times. But that is not for them to decide. All we have to decide is what to do with the time that is given us. Though I know the emphasis of each extract is rather different (and so is the context!) the argument seems to me ostensibly the same. And knowing that Tolkien (and C.S. Lewis) read George MacDonald, one of the two main “grandfathers” of modern fantasy literature (the other is William Morris) makes the link even stronger in my mind. I’ll leave this small observation here for you to ponder!